In one month, the 2016 Summer Olympics will kick off in Rio de Janeiro, Brazil. The news from Brazil has been increasingly bleak with concerns about the fast-spreading Zika virus, a political crisis reaching the highest echelons of the executive branch through the recent preliminary impeachment of President Dilma Rousseff, and criticisms about the country’s preparedness to host the international games coming from many angles, including the Rio state governor and mayor themselves. Even the normally celebratory exhibiting of the Olympic torch was marred by the killing of a rare jaguar who had been drugged and trotted out as a mascot. While the media has been quick to highlight these crises, there has been less coverage of the outrage that many Brazilians, advocates, and national and international human rights defenders have expressed about the social injustices that have worsened in the lead-up to the Olympic Games. For example, to make way for new Olympic stadiums and transportation projects, more than 77,000 people have been evicted from their homes. There has also been an alarming rise in police killings and a clampdown on freedom of expression threatens citizens’ right to free assembly and could criminalize protesters’ actions as terrorism. WITNESS has been working with community groups, media activists, and human rights groups in Brazil over the last five years on these issues, strengthening their use of video to not only document abuses, but to use their video as a tool for sparking investigations, for accountability and justice. Our biggest focus has been working with advocates on bringing much-needed attention to systematic police violence in Rio’s favelas, where heavily armed forces operate with near complete impunity under the pretense of fighting entrenched drug trafficking gangs. Through their tireless mobilization and advocacy, Brazilian activists are changing that equation, and video is playing a crucial role in the fight for justice. WITNESS is committed to strengthening these efforts. Below we share highlights of our work with partners from the last five+ years to provide a grounding in the stories and issues that media and politicians have not been paying enough attention to. Over the next month and a half, we’ll be bringing more stories from Brazil to you via our network of partners. 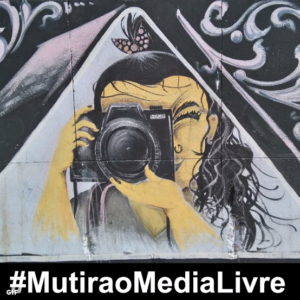 And from August 5-20, we’ll be sharing stories produced by the Mutirão Media Livre– a project of independent media makers and activists from across region (some of whom are WITNESS partners) who will be reporting on human rights issues and live streaming coverage of how the Olympics affect Rio’s communities. We’ll be publishing highlights of this coverage on our Portuguese-language website, and all of the content will be available on the Mutirao Media Livre website. You can also follow us on Twitter and Facebook for updates. Through our WITNESS Media Lab project we are joining efforts with partners in Rio to collaborate on a real-time curation of the video livestreams that activists will be creating during the Olympics and highlight the abuses expected to take place over the course of the Games. We’ll also be begin preliminary piloting for the Mobil-Eyes Us work in collaboration with local allies, seeking to find more effective ways of integrating remote viewers into activism on the ground. Stay tuned for more opportunities to participate in this pilot! After the massive street protests that erupted across Brazil in 2013, video proved to be a vital tool for exposing widespread police violence. In 2014, WITNESS edited a video-compilation of footage shot by citizens and activists to be screened at a special hearing on police violence at the Inter-American Commission. Read the related article here. Dispatch from Brazil: If killed by police, guilty by default… unless there is video? Video as Evidence in Brazil – a report by Article 19 and WITNESS highlights the potential of video to secure justice but notes that the full potential has yet to be realized. Voices of the Mission – Restinga from a 3-day fact-finding mission to many communities threatened by eviction in Rio, including the Restinga community. The mission was led by Plataforma Dhesca’s Rapporteur on the Human Right to the City, Orlando Silva Jr, and with the participation of 12 additional organizations, including WITNESS. Support for People’s Cup in 2013 Looking at activism gaining momentum one year before the 2014 World Cup held across Brazil. Can 114 Videos Tell One Story About Forced Evictions? An innovative, collaborative project that successfully refuted Rio’s mayor’s assertion that forced evictions were isolated incidents by using video to prove the systematic nature of these patterns across the city. Featured image is from Sebastián Liste/Noor Images for the New York Times piece,“The Media Doesn’t Care What Happens Here”.